Description: This sponge forms very thin vivid dark blue encrustations. Oscules are not usually apparent, they are small and mostly scattered around the edges of the sponge. Habitat: Frequently found beneath boulders in rapids and areas of strong water movement, both on shore and in shallow water. Distribution: Fairly common on the south coast of England and in south Wales, scarce elsewhere but found on western and Irish Sea coasts as far north as Scotland. 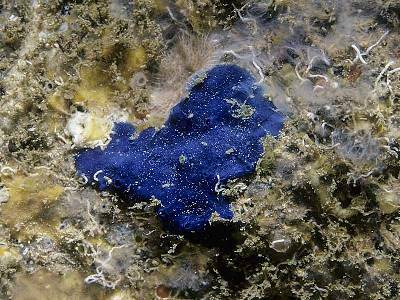 Similar Species: The only other blue sponge likely to be encountered in the British Isles is Hymedesmia paupertas. This is sublittoral and has conspicuous pore-sieves. Picton, B.E. & Morrow, C.C. (2016). Terpios gelatinosa Bowerbank, 1866. [In] Encyclopedia of Marine Life of Britain and Ireland.